Chicago Oracle Users Group - Cloud Experience Workshop Recap - "Hey Alfredo..."
You really can’t go anywhere these days without hearing about the “cloud”. If you’re an Oracle technologist you should be well aware of all the Oracle Cloud offerings that are available. If you’re a DBA then it’s critical to understand the role of the Oracle Cloud in your day to day decisions for current and upcoming IT projects. 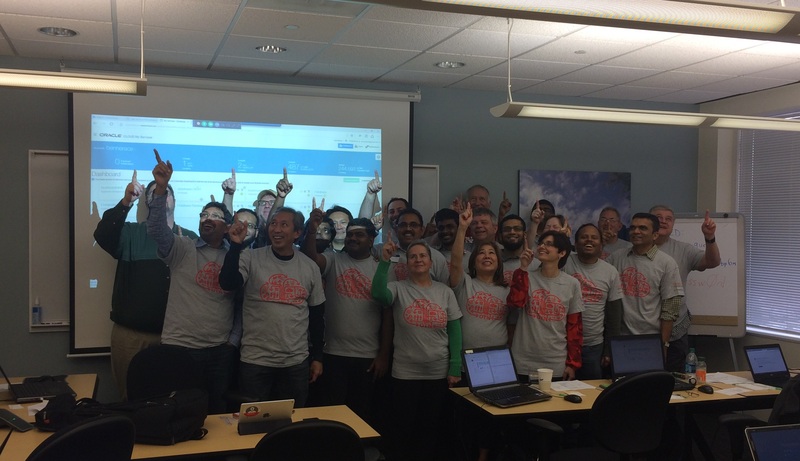 The COUG had an awesome Cloud Experience workshop at the end of October where we were able to experience building a database (single instance or even RAC) in the Oracle Public Cloud. Our workshop was led by Oracle Ace, Erik Benner. Erik started off the workshop with a great overview of the Oracle Public Cloud, which included explaining some of the key features as well as the importance of key based authentication for SSH. Once Erik completed his presentation everyone in the class paired up, logged in and created their first database on the Oracle Public Cloud. The user interface was easy to use and if you’ve been installing Oracle databases from scratch for some time, you’ll appreciate the simplicity of creating one with a few clicks of your mouse. Some folks made some good progress and were able to connect SQL Developer to their cloud database. They could then use SQL Developer to create pluggable databases and even rapidly clone them. We received some fantastic goodies from Mythics and some cloud t-shirts from OTN. Oracle provided us with lunch and snacks as well as allowing us to use their training room to hold our workshop. Thank you all! Want to learn more about the Oracle Public Cloud? Well you can do so for free! Go get your free trial account now and start playing around with it! The presentation given by Erik as well as the labs are available for download on the COUG Web Site. If you haven’t already, make sure to sign up as a COUG member (free!) so you can stay informed of all our events.